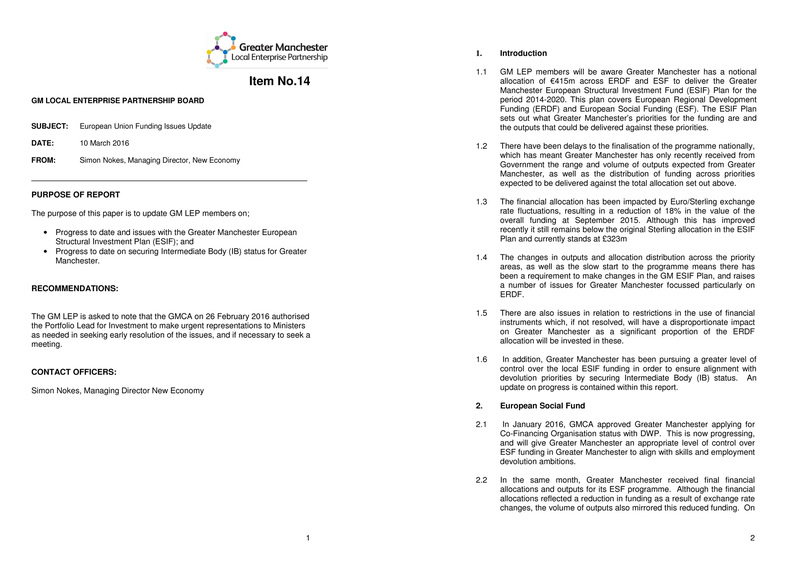 Greater Manchester’s European Structural Investment Fund administered by the Greater Manchester Combined Authority had fallen in value by eighteen per cent by September 2015 due to fluctuating euro and sterling exchange rates. Chronic-Oldham has never seen any articles in the traditional press that relate how money paid to the UK from the EU can depreciate before the payment is made as in the case here where money allocated for 2014 to 2020 is almost a fifth less than was expected. It is ironic that the UK was forced to pay an additional £1.7 billion in EU fees, despite already paying far more in than is returned, because the EU had underestimated how successful the UK economy was. Manchester’s Labour council’s are quick to point out the impact of government funding reductions to local authorities but operate a policy of only positive press for the EU. With 87% of Labour MPs already having decided well before the referendum announcement that they will vote for the UK to remain in the EU clearly European funding issues joins immigration and benefit costs on the GM discussion blacklist.